I found out that I was allergic to seafood when I was in 10th grade. I had been in the hospital on bed rest for about a month prior due to a hockey injury. When I was finally released, I had to come back periodically for for exams to make sure my body was healing properly. On one particular day I had to have a CAT scan. Well, if you’ve ever had a CAT scan then you know that you need to be injected with an iodine contrast in order to fulfill the procedure. I found out that day that I was allergic to iodine (coincidentally, the same iodine in shell fish). I never detected it before because I had never eaten any sort of seafood. My wife is convinced that I would be fine if I ate fish, but I’ll never forget the doctor telling me to stay away from all seafood, even though I was primarily allergic to shellfish. So, long story long… I’ve never eaten seafood before. But, it’s ok, there are plenty of other options out there for me! 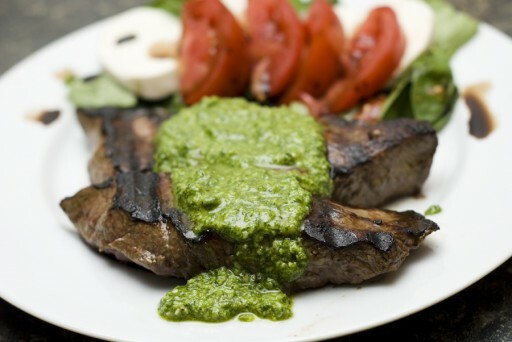 For instance, this fine looking steak covered in homemade pesto sauce with a caprese salad on the side. I’ve never put pesto sauce on a steak before, but I highly recommend it. Ok, let’s see how many pity points I get on this challenge for my sob story above. Come on 5! This looks amazing! Would never have put steak and pesto in the same sentence but I’m dying to try this. Um, this looks so good! 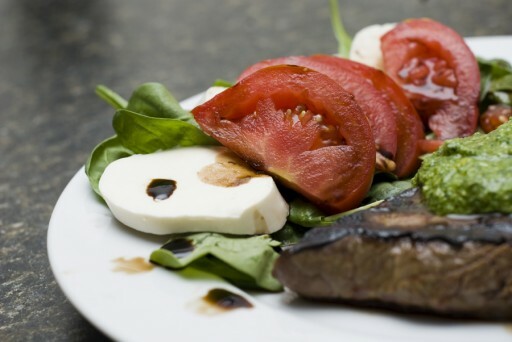 Pesto is my favorite and I love the tomato/mozarella salad to go with the steak!